Home / All About Baseball / WBC: America’s Pastime or Latin America’s? The 2017 World Baseball classic has come to an end with the United States hoisting the trophy. The Americans took home their first WBC title in a dominant 8-0 victory against the undefeated Puerto Rican team. Baseball is America’s past time, but which America? The United States of America or Latin America? Although the US won the classic, they weren’t most exciting team to watch in this tournament. Kinsler makes real and valid points when he says us Americans weren’t raised that way and it’s unfortunate we weren’t. The amount of chemistry and cohesiveness in the locker rooms of other teams far surpasses anything the United States could come near. Platano Power (or plantain power) is real for the Dominican Republic. It also has been in Fernando Rodney’s hand, waistband or locker during the World Baseball Classic. It’s the continuation of a routine that started four years ago at the last WBC, which the Dominican Republic won. And it’s true, the Dominican Republic was on an 11 game win streak until losing to Puerto Rico. While the Dominican Republic has excelled in the past two World Baseball Classics with the help of “Plantain Power,” Puerto Rico has boosted its own performance this tournament with Blond Bonding. The players have done so by dyeing their hair blonde. Although hair was tough to come by, even Carlos Beltran joined the party by dying his beard. They all dropped their Major League uniforms to dawn their country across their chest. It’s a sense of pride and unity American may never really have. Americans as a whole really underestimate the love and passion these latin players have for the game. They put their heart and soul into every pitch and at bat. And it isn’t just the players, the fans come in full support too. Drums were thumping, horns were blaring, maracas were shaking and it all leads to just a special environment. The United States versus in the Dominican Republic in the first round was living proof. Marlins Park was rocking. 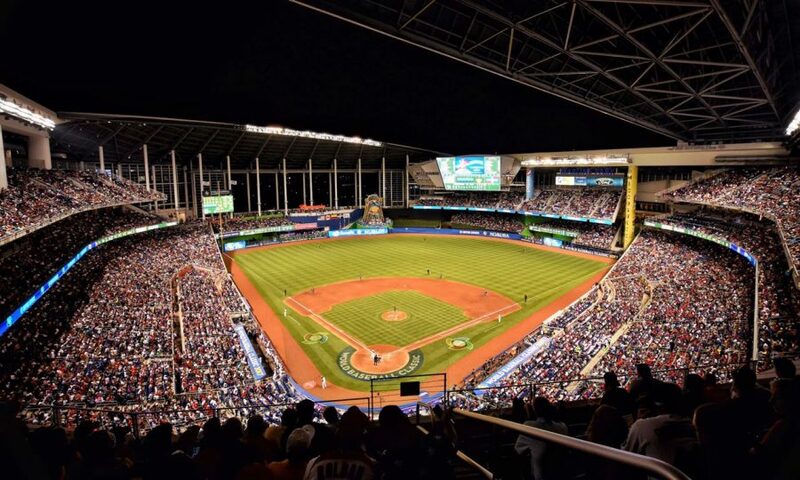 The game would set the attendance record, it was the first sell out at Marlins Park. Cruz’s go ahead three run home run erupted the crowd and it was the energy the kept the Dominicans fighting. These Latin ballplayers are all about the flash and flair and are definitely all for celebration. Javier Baez prematurely celebrated Yadier Molina gunning down a baserunner even before he placed the tag. Even Colombia brought excitement to the Classic. They showcased their young talent and played with as much heart as any other country did. Celebrations weren’t held back as they all cleared the dugout, hopping over the railing, jumping, screaming and applauding after a bases loaded walk. It’s time for Americans to take note and really watch how baseball should be played. Baseball is Latin America’s pastime and there’s no debating it.